Stop Using LayZ Board Hoverboards! 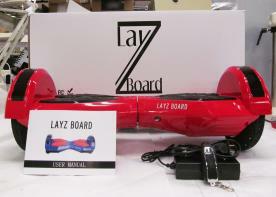 The Consumer Products Safety Commission (CPSC) has issued a warning to consumers to stop using the LayZ Board hoverboard because of a dangerous fire safety hazard. The warning was issued in a press release dated May 1, 2017. The hoverboard is equipped with a lithium ion battery which has a tendency to overheat when charging. If the battery overheats, it can also lead to a fire. The CPSC has found evidence indicating that the hoverboard was involved in a house fire that took the lives of two young girls on March 10 of this year. According to the press release, 3000 hoverboards were imported from Shenzhen China. However, no model or serial number information was provided with the press release. The LayZ Board is two wheeled, battery powered, and self balancing unit equipped with a balancing platform for the rider’s feet. The hoverboard does NOT have a handlebar. The name “LayZ Board” also appears on the front of the unit. A photograph of the unit appears below. It should be noted that there is a similar product on the market entitled “Lazyboard” hoverboards. This product is an entirely different product and has nothing to do with this notice. For additional information, consumers can contact the CPSC by calling 1-800-638-2772 or visiting the CPSC website at www.cpsc.gov.